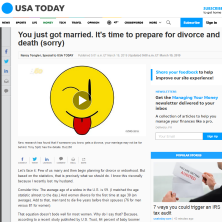 Let’s face it: Few of us marry and then begin planning for divorce or widowhood. But based on the statistics, that is precisely what we should do. I know this viscerally because I recently lost my husband. Consider this: The average age of a widow in the U.S. is 59. (I matched the age statistic almost to the day.) And women divorce for the first time at age 30 (on average). Add to that, men tend to die five years before their spouses (76 for men versus 81 for women). That equation doesn’t bode well for most women. Why do I say that? Because, according to a recent study published by U.S. Trust, 64 percent of baby boomer men are the dominant investment decision makers in their home, while 27 percent claim equal partnership with their wives. Only 9 percent of baby boomer women take on the dominant role of investing the family assets. If women are widowed at 59, divorced at 30 and tend to live longer than men, we need a plan. A plan that reflects our goals, our understanding and our participation. This is important for women and the men who care about them.